Last post 08-29-2011 12:54 PM by pyrocam. 4 replies. Hi guys, I have a rather complicated web based change control form, that allows you to pick a region, and the form will automatically put that regions current timezone in. 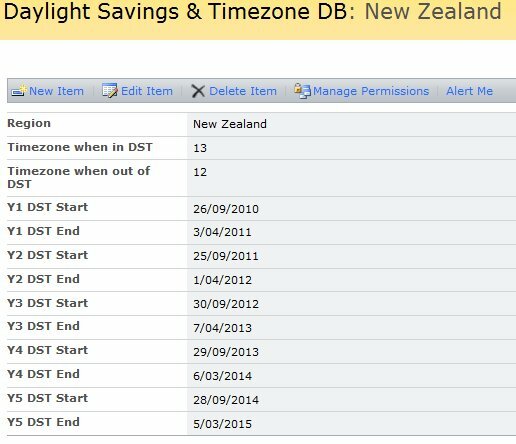 8 and 9 will do a lookup on the list again, if in DST is true then set the timezone to whatever the list says the timezone should be if in DST, OR if IN_DST is false, then do the opposite. 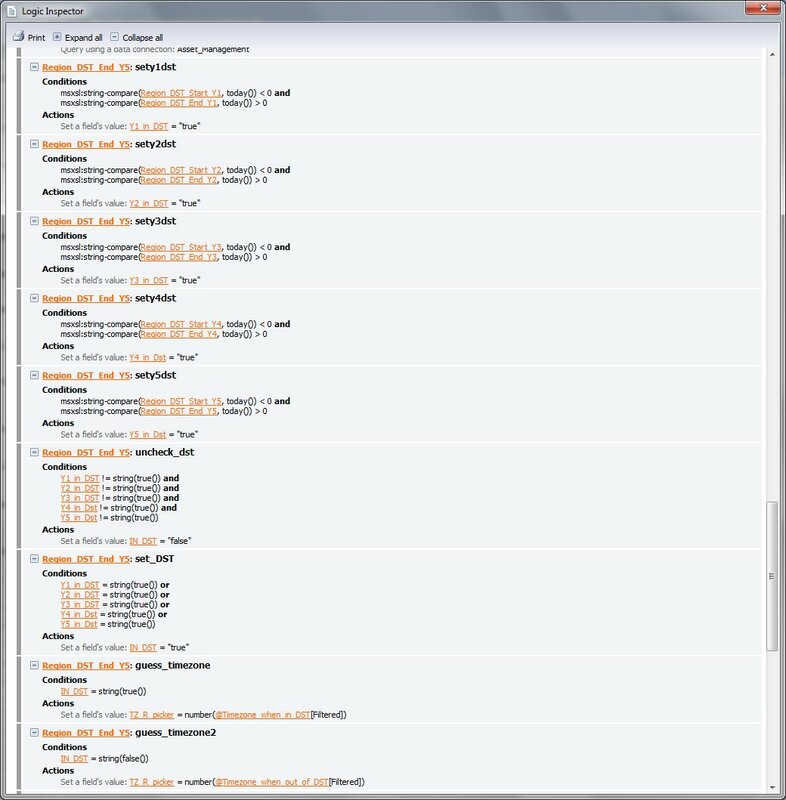 My second question, if this is the only way to do this with what I have available; how can I debug this further? at the moment there is a problem whereby if I set the region to a non-existing selection from the drop down (eg blank or a <-- please pick your region --> option ) then pick a real region, it will set the IN_DST checkbox to true regardless of any of the other checkboxes being checked, what I am having trouble with is diagnosing where the problem lies, I want a console or something I can step-through the form while it runs. Hi Hillary, thanks for your response. I have ended up using a workaround (creating an entry in the db called <--- choose region ---> ) since I already have spent too many hours getting this working, trying to start over with a new data source may be too timeconsuming for this project. I am working in Sharepoint application which is using Infopath forms.I have few date fields in Infopath form.Since the server located in U.S and this application was accessed by users who are in different work location in world , when comparing date it fails. If a user is in Austrailia and they are attempting to put in "today's" date (8/19/2011) which according to the server in U.S is greater than the system(Server) date in U.S (8/18/2011), the date validation is failing. We are currently using data validation formula today() in date field which is getting server machine time.To get the client machine time ,I used Javascipt code in formserver.aspx where able to get the client machine time but not able to bring into Infopath form.Please give some inputs. if its an internal only form, and the location information is published in your AD, you could use the sharepoint AD lookup to get the users region. then change your code to suit per region. doing your own verification if you have to. if you have many different locations that might be alot of work though.